Craig Sheppard and Roger Woodward are contemporaries but their approach to Bach could not be more different. Sheppard is full of clarity, rooted in the dance, allowing voicings to animate and course through his playing; he is aware of the latest textual studies and has written a rather absorbing booklet note that alludes to the interpretative thickets through which a performer seeks his own sense of the truthfulness of the music. Woodward’s notes consist entirely of the biographical – there is nothing of Bach or his approach to it. His playing is not kindled by Sheppard’s kind of aesthetic; for Woodward, despite his daunting modernist credentials, is a Bachian Romantic. I’ve chosen to reflect on the two Partitas that Woodward plays and to follow the ways in which both men respond to the daunting challenges before them. The Second Partita is a study in contrasts; the sense of improvisatory and romanticised freedom immediately established by Woodward in the Sinfonia is juxtaposed starkly against Sheppard’s architecturally surefooted control of the movement as a whole. If Woodward’s romanticism is rhetorical Sheppard’s clarity is analytical; the first isn’t overbearing, the second isn’t cool. But one could say that Woodward comes surprisingly close to Stokowskian grandeur in his responses. 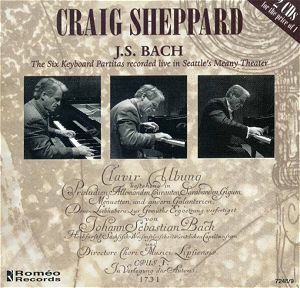 As one has noted before in Sheppard’s Bach performances – this one, as ever, live at the Meany Theatre, he is compellingly attentive to ornaments, to dynamics, balanced voicings and much else. It gives his performances fleetness and vitality. Woodward is more lateral, less inclined to probing accents and bass voicings. It should be clear by now which kind of performance will appeal. Even when their tempos are similar it’s the crisply articulated incision of Sheppard that brings out the dance in the music. Woodward prefers romanticised character building – try the Rondeaux which is a controlled character study in his hands. For Sheppard the attraction lies in its crispness, its pellucid colouration, its warmly distributed melos. This absolute control of rhythm is most evident in the Capriccio finale of the Second Partita. The dextrous range of colours that Sheppard evokes is allied to a superb sense of accenting that gives the music impetus without appearing rushed. The precision of his articulation is frequently spellbinding – probing musicianship. Though there is only fifteen seconds between them the differences are absolute, Woodward’s horizontal eloquence emerging from an altogether different tradition, a richly contoured, but more essentially static, dance-denying one. The Sixth Partita reprises the qualities both men bring to the music. Once again Woodward prefers a reflective, quasi-improvisational Toccata, his rubati and accelerandi reflecting these tastes. He bathes the music in warmer, rounded colours and with an inward, introspective feel. Their responses to the Air are striking, Sheppard takes 1:39, Woodward 2:08. But that is not the real story. Woodward is clearly more static and prefers affectionate warmth of sonority. Sheppard by contrast is crisp and aerated; the characteristics of the piece are entirely opposed. Woodward, in short, shows in the Sarabande that he is majestic where Sheppard is fluid. The rather stark romanticism of Woodward’s concluding Gigue is again contrasted with Sheppard’s culminatory, razor sharp, drive. Two final things. Firstly, Woodward’s Chromatic Fantasia and Fugue is of a piece with the other performances; a strong sense of metrical freedom allied to sonorous warmth and a Fuga that is controlled and assured. And secondly Sheppard’s remaining four Partitas are entirely reflective of the two under discussion here. The two performances then are widely divergent. Their interpretative lineage however is evident. Woodward’s are readings of serious-minded warmth, somewhat slow, rather static, even stoic. Sheppard’s are performances of filigree light and clarity, borne crisply and with vital imagination. My own preference is pretty clear I should think, but others may not agree.